I’ll tell you all about how adamant I am about checking every page, every link when it goes up (content management system or not, you’re not putting up hundreds of pages at once). If you’re not going to do that, you should routinely run automated link checks on the site, and instead of just looking for broken links, run a report and look for links to your development and staging environments. They’re probably not going to break on your machine if you’re geared to test in those environments. As a reminder, when you’re reviewing a Web site (or anything for that matter), don’t overlook your headings. It’s very easy to do when you’re concentrating on copy or on whether the Web page itself looks and works properly, but those poor little textual or image-based headings need some loving, as in QA abusive loving, too. The words in the heading are spelled correctly. The heading actually applies to the text. The heading corresponds to any anchor tags associated with it. The heading is in the proper font and size for headings (especially if it’s an image). The heading’s structure is parallel with those of equal heading level. The heading’s grammar is correct. alt and title attributes for heading images match the image text. Headings render in the same style across browsers. They’re just one little aspect of each page, but you and a lot of people in your organization (and your clients and audience) might overlook them. Everyone else has an excuse to do so. You, QA, do not. Rodney Atkins is a country singer, but he sings about the testing phase of any project as though he’s lived it: “If You’re Going Through Hell (Before the Devil Even Knows)”. 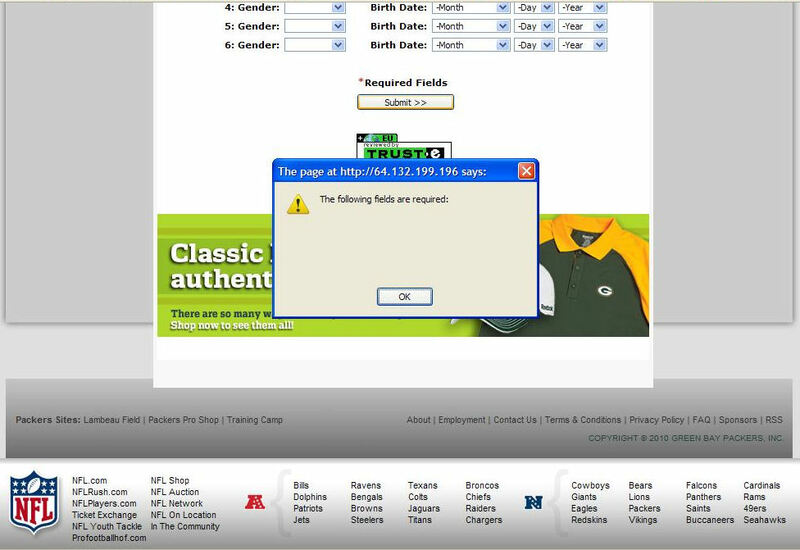 I’ve mentioned previously that any time you’re generating PDF files, you need to check the properties of the PDF file to make sure it’s not putting your name or your company’s name in it, such as when your name is Rick Mathers and your company is SpecialtySEOMarketingAndDiscountCigarettes.com and your client is a nationally known brand of baby formula. porklord sends in this example, the worst case scenario: a press release from some hacker group with the hacker’s name in the document’s properties. When you’re proofreading technical copy, remember there should definitely be a space between the number and the measurement. Apparently, that’s from the SI Brochure which is the style guide on talking about measurements. You have to get a little calloused to work in QA. Therefore, as a public service, we here at QAHY offer a small portion of our training media. Which reminds me, I have to book the conference room for the annual screening of The Wall. It’s a good opportunity to remind you that every single auxiliary, small time pop-up window in your Web application requires its own testing. A lot of times, you’re so busy focusing on the major, full size main browser windows that you can miss these bits. Maybe you don’t click the link that launches them, maybe you just make sure it opens as you expect it. But you have to make sure not only that the data is correct, but that the navigation within it works as well. Make sure the Print link spawns the print dialog. Make sure the close links close the window. Treat it like it were a Web page like any other in your site. Save the planet, use the WWF file format. And multiply your PDF file compatibility testing woes. Here’s a song that is fifteen years old already: “Everything Falls Apart” by Dog’s Eye View. It’s a song about weakness in relationships, but I think that’s a metaphor for the flaws in the SDLC and the countervailing tensions involved in the business and the technology of building a product people will use. Or maybe I have to say that since I wanted to listen to this song. Well, I wasn’t going to spend an hour or so on the phone trying to fix it, so I uninstalled it and reinstalled it on the new machine, and when I tried to run it again, I got the same catastrophic error message. Was it time to call customer support and face a bullet of whatever precious metal Adobe uses? Of course not! I’ll take another look and…. Instead of creating a shortcut on the desktop, I’d copied the executable there and tried to run it, and the poor little application was lost in the big forest without its dependencies. Yeah, there I was, a computer professional making a mistake that rendered Adobe Dreamweaver speechless. So, what does your application do when it cannot find its dependencies? If it’s anything like this particular application, it spits up an unrelated error message and it asks you to call support. And support will have a werewolf of a time trying to figure it out. So play around with your executable locations, including putting dependencies on network drives and not connecting to them, altering paths, maybe renaming directories without changing them–particularly if you can change the name of a directory from within the application and the application stores the hard file path somewhere within it (I used a testing tool once that let me do that, and then it could not find its own tests). Granted, you’re not going to convince many people that these are high priority defects, but it’s something you should still consider when trying to build a quality application. So who’s running the QA office pool about which Web store fails first from the load on Friday? Omaha Steaks were a hot topic on the Today show earlier this morning. The Today show announced that Omaha Steaks is extending some of the great deals it offered earlier during Black Friday and Cyber Monday. The response from viewers was so overwhelming, the Omaha Steaks website crashed for a period of time. Thousands of enthusiastic shoppers looking for deep discounts and free shipping on select steaks had to patiently wait for the Omaha Steaks site to come back up. 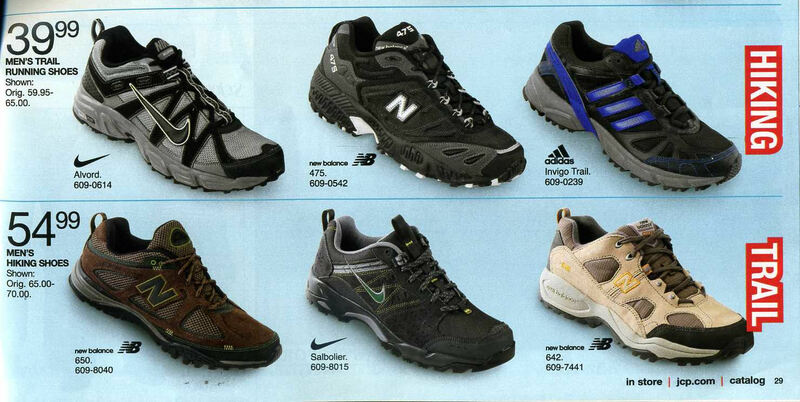 The spot was probably available, since no one remembers the middle tier retailers. Kinda like the middle tier retailers never bother to load test. This is another indicator why QA has to test every thing, every time. To make sure that key components of the framework have been fleshed out so the application doesn’t end up at a dead end. All right, so this piece of remote desktop software is like a silver bullet. Does that make the customer the werewolf you’re trying to slay? Maybe its your software, you know, the one that you’re trying to support using this GoToAssist Express package, that’s the werewolf. 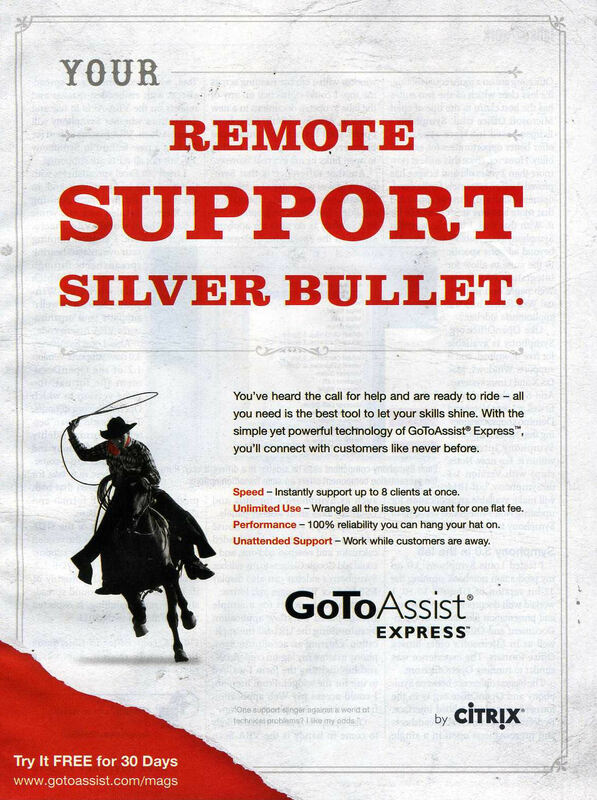 A normally mild-manner piece of software, every full moon your company’s application goes on a rampage, and AssistTogo Express is what you need to kill the beast once and for all. The text doesn’t really develop the metaphor, so I kinda have to infer here. Wait, the headline is in a sorta Western font, with some little rodeo horizontal rules and a picture of a man on horseback and a lasso. Wait a minute, let me freaking stretch the metaphor here. Although he’s not depicted at all (licensing costs > clip art, you know), the Lone Ranger left behind a silver bullet at the end of his old television serials. Kinda like the client-side momento GoToExpress Assist leaves behind after your support session is done, and the bad guys–again, I think this is your company’s software–are dispatched after threatening the innocent townsfolk–that is, your customers. Am I getting closer here? Not even close? Wait, is the ToGoAssist Express like a cold, refreshing Coors Light after a long, hard day of the manual labor that is trying to install and configure your product? I mean, Express is a kind of train and Coors Light has its Silver Bullet Train. No? Wait, I got it. The marketing staff used this buzzword without knowing what it meant and, as a result, has given us something senseless. Well, no, in a fashion, it does make sense: it spent the marketing budget, and they all retired to the pub for a drink on the corporate credit card after its successful launch. Probably not a Coors. Marketing staff would be only slightly less likely to drink a Coors than to understand the software it’s trying to pitch or the rich and literary-allusion-laden language it’s trying to pitch in. UPDATE: Welcome, Citrix readers! Wow, that’s a lot of Macintoshes. You must be the marketing department. Remind me to tell you the story of how the head of sales where I once worked tried to call our product “Nirvana”–the Buddhist equivalent of perfect nothingness–and then “Valhalla”–where the heroes go to die and await Ragnarok, the final climactic battle of good versus evil where good is going to lose. Of course, he’s worth millions now, and I still rent my services for low, low rates. Pentagram offers a little analysis and helps you discover your type. Since I got it, I declare the QA typeface is Corbusier Stencil. However, if you share this with your designers, you must tell them you got Times New Roman no matter what. Tell everyong else you got Comic Sans. Want An International Audience? Remember IE6. As long-time readers know, I’m a harbinger of the past, however that works in light of the space-time continuum, and warn you (and my clients) to consider IE6 carefully when discussing browser compatibility. You cannot not consider it and must specifically choose to reject it. Don’t just let it fall out of decision-making because nobody uses it any more. Except 108,480,000 Chinese Internet users. According to data from Web analytics firm Net Applications, 45.2% of China’s Internet users still rely on IE6. IE6’s usage share in China is more than five times that of the rest of the world, Net Applications said earlier this week when it released November’s statistics. IE6’s usage share in all countries other than China was just 7.6% last month. The browser’s global average share, which includes China, was 14.6%. China’s reliance on IE6 skews Net Applications’ results because the Aliso Viejo, Calif. weights its data by the Internet population of each country, a methodology it said provides a more accurate picture of browser usage worldwide. Oh, yeah, 7.6% of 240,000,000 users would mean that, in the United States, 18,240,000 Web users run IE 6. That’s not a small number either. This article points out that IE 6 has a 6% share in companies with fewer than 500 employees, but a 12% share in companies with more than 500. As I always warn, corporations that built expensive applications to, erm, take advantage of IE6, they’ll be slower to move into newer browsers and rewrite those internal applications to take advantage of the new technologies. Don’t let your requirements gatherers overlook those numbers. You cannot wish IE 6 away. Posted in Miscellany | Comments Off on Want An International Audience? Remember IE6. Screw the fluff, let’s start the week with some punk. Here are The Distillers with “The World Comes Tumblin’ Down”. Be advised the song has the f-word in it. The advice: Turn it up. You are currently browsing the QA Hates You weblog archives for December, 2010.